Please consult this suizeguide to choose your perfect size! If you are in between sizes, choose the smallest size for a snug fit, the wrap dress can be adjusted easily. Model Joëlle 1.73m wears a size XS. Miss Candyfloss exclusive for TopVintage, limited stock! 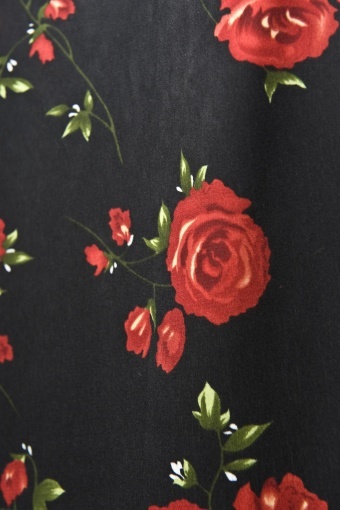 40s Rosie wrap teadress roses red black. Again a beautiful unique design from the Swedish designer Adele. It is a perfect mix between the feminine teadresses from the 40s with an slight oriental influence. The red collar and accents gives this romantic red rose dress an edgy look! The wrap dress gives you so much freedom to adjust it at your bodytype with the long red satin belts. The top is fitted and ends in a full circle dress. Made of nice stretchy 'silky heavy' fabric for a perfect fit. So what are you waiting for? Let's dance honey!